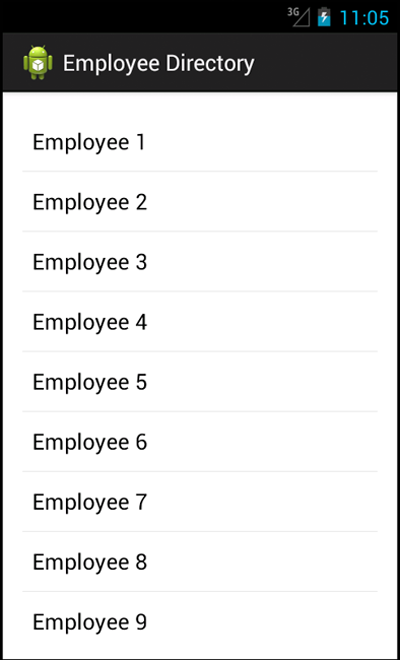 A few years ago I came across this tutorial for Building a mobile employee directory sample with Flex and Flash Builder. The following few posts will outline what I have learned by developing a Native Android App with similar functionality. To start, create a new blank app in eclipse by selecting File, New Android Application Project. I have set my Application Name to “Employee Directory”, my project name to “EmployeeDirectory”, and my package name to “com.himebaugh.employeedirectory”. Click next through all the default settings. Modify MainActivity.java & activity_main.xml to the code below. //	Step 1: Create a blank App in eclipse. Modify it to display a ListActivity with some data.